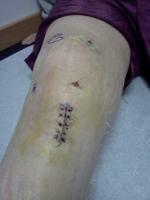 I had a tib-fib fx 3/2006, plate & screws were in for almost 6 months, couldn't weight bear for several weeks. No physical therapy of any sort followed (none prescribed, none suggested for home, just "pay attention to your limits" basically). It is now two years later (happened 3/06), and i am having increasing pain in that ankle, swelling is always a problem (leg looks like a tree trunk some days). I am having a great deal of pain at the calf, where it seems like the tendon would attach to go down to the achilles heel. the lateral side of ankle/heel very painful after periods of rest. Pain under heel, very specific spot toward outer foot, as well as lateral side of foot. Sometimes, I am unable to walk without assistance. Has worsened over the past few weeks. No new injury. Could this be ligament or tendon damage, and if so, is this likely to be permanent? Have tried anti-inflammatories, wrapping, compression stocking, icing, menthol rubs, massage... only offers very short term relief. Is this normal?